Total mood magnet for my wishful thinking today. Heh. 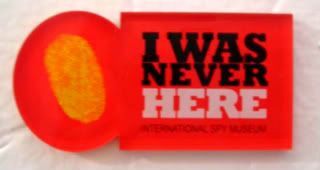 But, the International Spy Museum in Washington, DC, is definitely worth checking out. They give you a fake identity to learn and remember throughout your visit with a total quiz at the end. It's musuem interactivity at its best. There's climbing through air ducts, looking at the history of espionage (hello, Julia Child! ), and a ton of other rooms, too many to name. There's sitting in the Oppenheimer room, feeling the first nuclear blast. There's Codetalking! And an Enigma! If I had a complaint, it would be only that it's always just WAY too crowded with bodies.